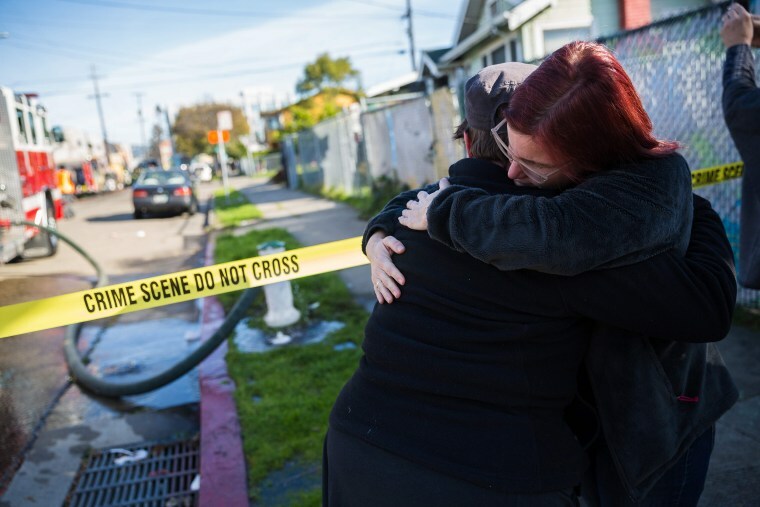 Survivors of the deadly fire at an Oakland, California, warehouse party described on Sunday how quickly the flames "completely engulfed" the structure and having to leave a friend behind — as authorities said the death toll has climbed to at least 33 people, with others still missing. Bob Mulè, a member of the "24-hour artists' collective" that was inhabiting the warehouse, told the TODAY Show on Sunday that he was forced to leave behind a friend and suffered burns on his arms, hand and shoulder while trying to escape the flames on Friday night. A black vest Mulè was wearing during the fire was completely charred in the back, he said. Mulè said after finding a fire extinguisher that did not work he ran to get his camera when he saw Peter Wadsworth, a fellow member of the collective on the floor. “If I didn’t have this vest on while I was pulling out Pete, I don’t know it would’ve been me too probably,” he said, his voice cracking. Mulè later told NBC News he was “100 percent certain” Wadsworth did not survive. Wadsworth is currently listed by friends as missing. The Alameda County Sheriff's office said in a press conference Sunday afternoon that they have located the remains of 30 victims from the fire. "We anticipate the number of victims will rise and it will increase," said Alameda County Sheriff's Sgt. Ray Kelly earlier Sunday. He said that officials have only searched about 20 percent of the building as of Sunday morning. "This is very hard work and its very slow and it definitely has taken a toll on the first responders," Kelly said Sunday morning. "We have people around the clock and we will be here for days and days to come." At an impromptu press conference Sunday afternoon, Kelly told reporters that officials had located 30 victims. "That is an astronomical number," Kelly said. "We're really starting to get deeper into the building and as we do that we continue to find more victims." At a later press conference the number rose again by three. Kelly said officials plan to begin releasing the names of the victims later Sunday. Authorities also asked family and friends of any of the missing to preserve sources of DNA for evidence. "The magnitude of loss for this community and for these families is unspeakable," she added. "Our job right now is to stay focused on that as our priority." Oakland Battalion Fire Chief Melinda Drayton said at the press conference Sunday morning that firefighters had worked overnight to systematically remove debris from the warehouse. "Within 12 hours we made it through one fifth of the building," she said. "This will be a long and arduous process but we want to make sure we are respecting the victims, their families and our firefighters' safety to work slowly and carefully through the building," she said. Drayton said the fire "is the most deadly" that she was aware of during her 19 years as a firefighter. The first floor of the warehouse was an artists' collective made up of divided work spaces that Fire Department Operations Chief Mark Hoffman described as a "labyrinth” on Saturday. The structure was last permitted for legal use as a warehouse, officials said, and did not have the permits necessary for people to live in the building. During the fire at the building known as the Oakland Ghost Ship, the roof collapsed onto the second floor where the party was held, and parts of the second floor collapsed onto the first floor, officials said. The Oakland Planning and Building Department launched an investigation into the habitability of the warehouse less than a month ago, citing an “illegal interior building structure,” according to NBC Bay Area. Records obtained by NBC Bay Area also show the warehouse and surrounding area have been the subject of nearly 10 blight complaints over the past decade. Max Ohr, the creative director of the art collective that used the warehouse, told the TODAY Show Sunday that he was working the door on the night of the party and around 70 people were “in the venue enjoying music” when he heard someone say there was a fire. Ohr said he "saw an orange glow coming from the back of the warehouse" and ran to get an extinguisher. "I ran back and got maybe one squirt out of and realized it wasn’t going to do anything," he said. "The roof had already caught and the flames were coming towards the door at an alarming rate." "It took about 15 seconds to go from notification of a fire to completely engulfed," he added. Ohr said there were no sprinklers in the building prior to the art collective leasing the warehouse and Fire Department Operations Chief Mark Hoffman said Saturday night he saw no evidence of sprinklers. Ohr added that he believed it was an electrical fire and they had reported problems with the building’s electricity to the warehouse’s owner. “They were not very helpful with us throughout the entirety of our struggle with the electricity here so that’s my first instinct is to think perhaps some of the building’s wiring had something to do with this,” he said. “The landlord has been in communication with both myself and the owner of this space for at least three years now and the electricity was a major issue prior to my coming on board,” he said. In a statement to NBC Bay Area on Saturday, the warehouse’s owner daughter said the family had no comment. “We are also trying to figure out what's going on like everyone else. We're so sorry to hear about the tragedy,” Eva Ng said in an email attributed to her mother, building owner Chor Ng. “Our condolences go out to the families and friends of those injured and those who lost their lives." Ng did not immediately respond to a request for comment on the warehouse’s electrical issues on Sunday.